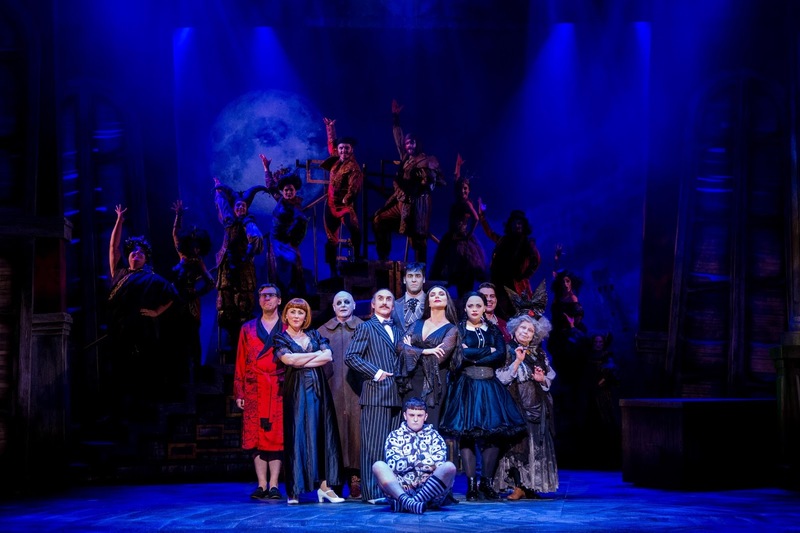 The Addams Family | Birmingham Hippodrome. The Addams Family are a kooky family that we've come to know and love over the years, through the TV series or the 90s films and it's a family that some of us have probably dreamt being apart of. Their quirky, dark and mysterious ways have captured our attention so the news of a UK Tour was like music to my ears. Unlike a lot of other UK Tour productions I have seen in the past this production was next to none in it's presentation, even the stage design from Dieo Pitarch really managed to capture the darkness, daunting but very interactive show that Addams Family must be. 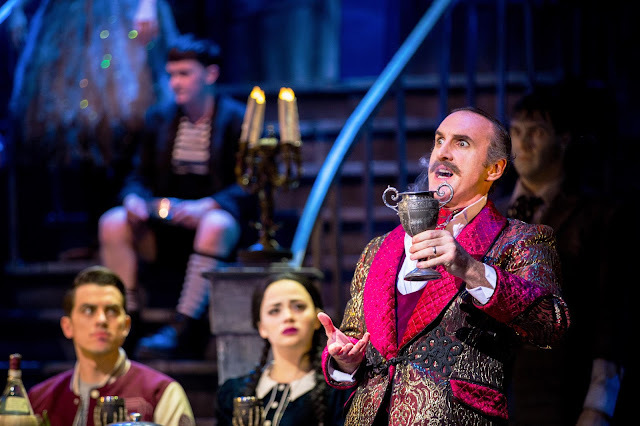 Like many UK tour productions it comes with a star studded cast and Addams Family is no different with Eastenders' much loved Samantha Womack as Morticia, comedian Les Dennis as Uncle Fester and last year's Chitty Chitty Bang Bang's Carrie Hope Fletcher as Wednesday. If your after a production which is fun, upbeat and has a touch of nostalgia then definitely join this incredible cast as they bring you back to their home where it all happens! In this stage production we're reintroduced to the kooky family many years later, everything is still the same apart from focusing on the dark, goth and monotonous young woman that we've come to know as Wednesday Addams, played by the multi-talented Carrie Hope Fletcher. Her performance of the grown up Wednesday that is so loving, passionate it makes you as worried as her parents are was so well executed, showing us that she commands the attention of her audience as soon as she enters. Carrie is flourishing in this role, it has been known to be the role she has wanted to play for a very long and her interpretation is flawless. She's a force to be reckoned with and I'm always excited by her continuation to be one of the best talents out there. The princess of darkness is all grown up in this new UK Tour production and this time she has a secret, a secret that only her father Gomez knows. Like most young women her age she's fallen in love, with a enthusiastic and wonderful young man who comes from a respectable, definitely more "normal" family than that one that Wednesday belongs to. Her chemistry with her on stage lover Lucas Beineke, played by Oliver Ormson was so well done, they had clearly worked continuously to make their relationship convincing to the audience. I loved their harmonies in Crazier Than You especially. Gomez decides not to tell his beloved Morticia about this secret until the two unlikely families are brought together for a family meal where they will meet for the first time over dinner. A "game" will put friendships and relationships to the test. What I loved about this production of Addams Family was that it managed to capture the humour and fun that the original stuff had, none of it is lost in it's transitions from screen to stage. Each of the Addams Family characters are quite iconic individually but each professional managed to adjust them according to their own style, whatever that may be to them. There wasn't a feeling that any of them relied on sources already available to them and were key to making them into their own. You can imagine the challenge set upon them to capture a family that is so loved so expect Gomez (Cameron Blakely) to be as full of charm and charisma that makes you love him in an instant and Uncle Fester (Les Dennis) to have you laughing out loud with his stage presence in it's own. I was a bit let down by the limited stage time of 'Thing' on stage but his appearance was definitely appreciated by the audience. One of the best performances of the night as a collective were the Ancestors, a collective of 10 people who fill the stage with their individual characters, high level of energy and enthusiasm. Their contribution to the plot line didn't go unnoticed and really helped to take you through the many ups and downs we experience. I thought it was great how they took notice of their invisibility to the 'normal' family and how this transitions towards the end. I absolutely appreciate their contribution to the production, their execution in the fast paced choreography completely flawless from each person. I'd see it again just to watch their individual characters come to live with their characteristics. I will definitely be trying to get my hands on more tickets for this production before it's tour ends! Performing at the Birmingham Hippodrome until Sat 10 Jun but check out their website to see where else they're heading! OMG, I wish this show was coming close to me. I would really love to see the show. I've watched the TV show in the 60's and loved the movies from the 90's. The ones only with Angelica Huston.